From the high of debuting new toy protos to the shattering low of having them disappear without a trace. 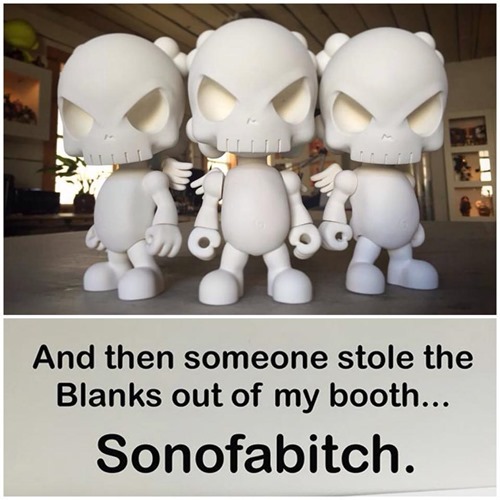 Unfortunately, that’s the whirlwind of emotions that Huck Gee experienced as he put three of his Skullhead Blanks on display at the Singapore Toy, Game, and Comic Convention (STGCC) over the weekend. First, the good before the ugly. The Skullhead Blanks look great -– a nice combo of detailed head sculpts with a satisfying chunkiness befitting a designer toy platform. In addition to the bitter sweet pic from Huck (above), hit the jump for a nice in-hand pic from @lefocker. As for the unfortunate ugliness, it turns out that someone apparently stole the trio of blanks during the show. If you have any info/tips on that might result in getting the Blanks returned to Huck, drop him a line at [email protected]. Hopefully someone will step up and help remedy this rather awful situation. While we can’t will the Blanks back into Huck’s possession, we are looking forward to their eventual release and success as a self-produced, artist-driven, indie platform toy. The 2015 Singapore Toy, Game and Comic Convention (STGCC) is underway (9.12 –9.13) and Instinctoy has a dizzying selection of new toys available at their booth (AA92/AA94). The overwhelming onslaught features new versions of their signature toys including the Illusion GID Muckey, two Halloween inc figures w/ matching Bat Liquid, two Baby incs, multiple Liquid drops, and more. 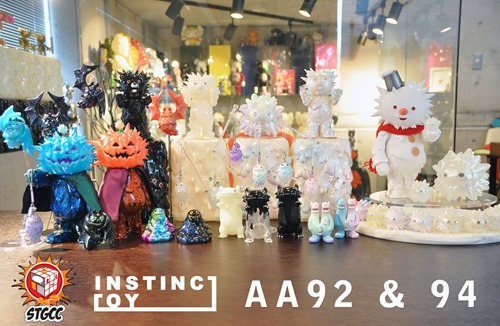 Instinctoy is also debuting new toys and special editions including the latest in the ever-expanding liquid creature lineage from Byron Liquid figures with Koraters to the brand-new Snowy (Frosty meets inc/liquid) and Bat Liquid. 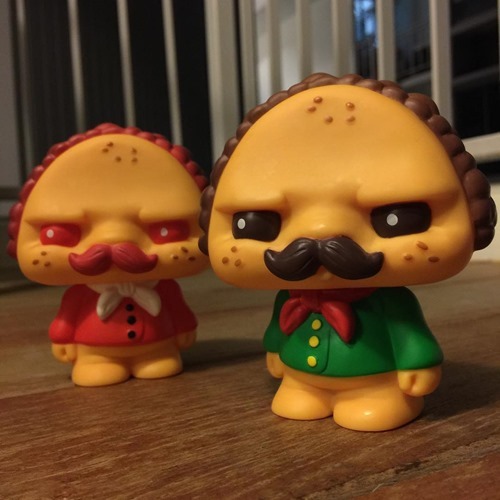 The brand is also taking pre-orders for their new Curio figure (a liquid cat) in its first GID edition as well as giving collectors the first look at the upcoming Mini Muckeys (!!!) which will see their first release at TTF. Hit the jump for several preview pics as well as the seemingly never-ending official list of all the toys available at the show -- too much goodness for the suitcase (and the wallet).